The change between daylight saving time in summer and in winter is handled differently, depending on the Windows version that you use. 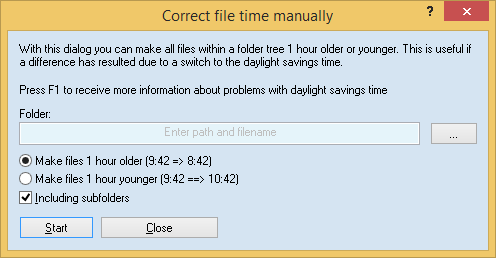 Due to the combination of different Windows versions in a network it can happen, that suddenly all files on one computer have aged (or become younger) by one hour. This influences the synchronization, of course. Normally Easy2Sync recognizes this problem automatically and corrects the file date. But you can also use this function to correct the file dates of a directory tree manually.